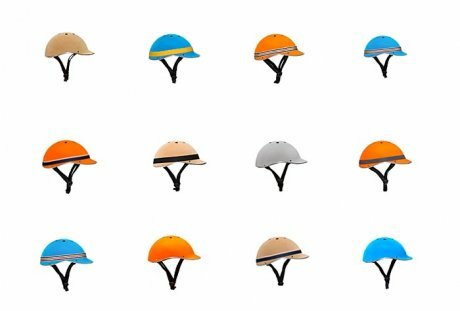 London-based founders Catherine Bedford, a luxury accessories designer turned trend consultant, and Graham Parker, former Head of Editorial & Creative Direction at Harrods, first had the idea to create a collection of cool cycling helmets whilst watching the Olympics in 2012. 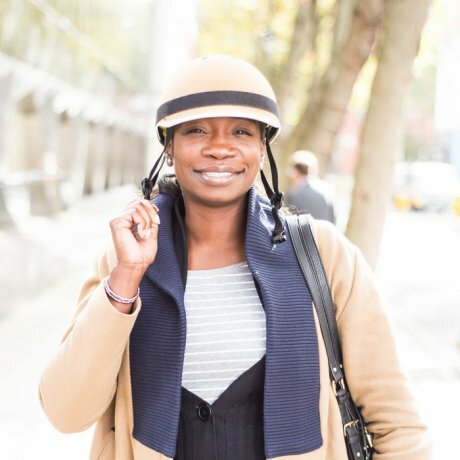 It occurred to them that there were no helmets out there that they’d feel good wearing, so it became their aim to create ‘attractive, stylish helmets that appeal to urban cyclists and to support UK manufacturing’. 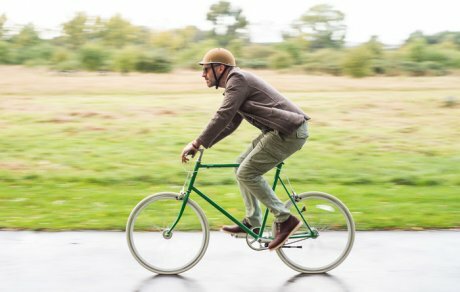 Made by hand in Cornwall to strict safety standards, Dappercap helmets are in fact the only cycling helmets that are designed and manufactured in the UK. Who would you love to see sporting a Dappercap? How long have you got! Out of the hundreds we’ve thought of we’ll give two from our top ten: Vivienne Westwood as she has always innovated and she ploughs profits back into saving the planet, and Victoria Pendleton - now that she’s not racing our look could suit her vintage style. How did you go about finding a UK producer who had all the technical know-how and craftsmanship required? What else do they make at their Cornish factory? Grit and determination. Travelling round the UK to meet with manufacturers to see if they would diversify (there is no cycle helmet manufacturing in Britain anymore). Our Cornish manufacturer is a family business and has the right attitude and the ability to experiment. They currently make safety helmets for the marine industry. You mention in your crowdfunding campaign that you are driven to make ethical and sustainable choices - how has that ethos guided your decisions up to this point? It would have been easier to manufacture abroad. Costs would be lower but we wouldn’t have as much control over the workforce and the conditions they work in. We feel passionately about promoting the craft heritage we have in the UK. We’ve sourced not only manufacturing but components here. The webbing for example is made in Yorkshire, though again we could buy this for much less from abroad. More components could be sourced from the UK when we reach the sales required to meet their minimums. Here Kickstarter is useful, as it shows suppliers what we are about and what the product looks like. When a Dappercap reaches the end of its useful life, how can it be recycled or carefully disposed of? We are investigating a new reclamation facility where carbon material can be upcycled and will see a second life rather than being put in a landfill. Ideally we would like helmets to be returned to us in return for a voucher off the next purchase, so we can oversee the carbon elements being upcycled. How do you find that all important balance of safety, function, ethics and aesthetics - presumably safety has to take precedence? Safety comes first. However by investing more into the product and the materials it is made from, there are materials out there that allow you to create a slimmer helmet with a more pleasing aesthetic. Design has been our differentiator but we know we have to make a product that's protective, comfortable and easy to use. By offering a wider range of sizes we will allow wearers to buy something that fits well without any extra bulk. However this means that we become more expensive as every individual size requires its own moulds, tools and safety tests. You are supporters of the Slow Bicycle Movement - tell us more about that and how it informs your products? We love cycling for leisure – along canal paths, meeting friends in a cafe or visiting the farmers' market. But we always wear our normal clothes and don't like getting hot and bothered. For us, it's all about enjoyment, not speed - getting out and enjoying the city and taking our time. Our helmets are a reflection of this, and are aimed at people who feel the same way. The Slow Bicycle Movement does not advocate the wearing of cycle helmets, so we’d like to make clear that we have taken inspiration from their ethos, but this is not being done in conjunction with them. How do you aim to integrate a social enterprise model into your business? We think that the branded bands that our helmets can be accessorised with, would be perfect for social enterprise. We’ve already met with The Handmade Alliance to see how this might work. We also intend to become a co-operative as we think that such a business model would be a natural fit with our ethos and the industry we are operating in. Overall, we want to support working individuals by providing jobs with flexible working hours. For example, why do so few businesses allow workers to work hours that fit around a school day so that they can combine work with family life? What are your plans for the future after the crowdfund has closed? We are continuing with manufacturing, regardless of the outcome of the Kickstarter campaign. 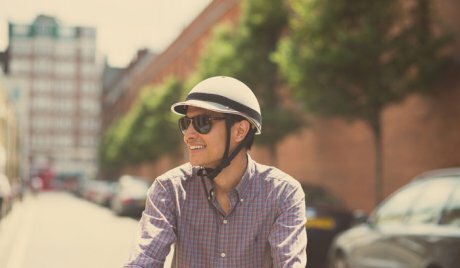 Kickstarter has been about raising awareness for us, building our network and giving early-adopters the chance to buy helmet at 30% off. We then hope to export our helmets to cycling communities across the globe. On the development front, we are looking forward to developing a wider range of bands that the helmet can be accessorised with and hopefully working on some designer collaborations. We are already looking at our children's range. There are some new materials out there, that have never been used in cycle helmets before, and we think they'll be perfect for developing a modified version for children who give their a helmets a lot of wear and tear. Pledge £250 or more to receive 'The Bird of Paradise': choose a luxurious moleskin helmet in any colour you like and Dappercap will make it for you! Additional helmets in the same colour can be ordered for £110 each (postage tbc depending on amount ordered). Pledge £1,100 or more and you'll be 'Flying high': love the helmet but don’t have the bike? Come to London and have a consultation with Kennedy City Bikes, who will hand make a bike for you. Plus Dappercap will make you a customised helmet in any Pantone colour of your choice. And hang out for refreshments with the founders. (Transport to London & accommodation isn't included). As is the way with crowdfunding, the finished product won't be ready for a few months yet. However, aware what a brilliant Christmas gift a Dappercap could be, if you pledge your support, the team at Dappercap will send you a gift card in early December that you can pop under the tree for the lucky giftee! See Kickstarter for details of timescale and delivery to the UK and further afield.